Best 13 mile run EVER! 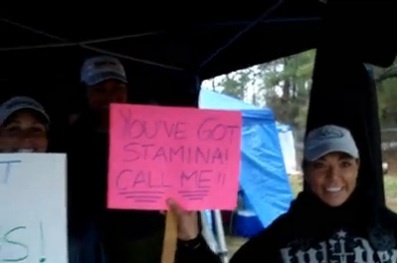 On March 6th (yep, a little late on the report here...) I paced my friend Jason through miles 80-93 of his 100 mile race. I was so excited to be one of his pacers. We started talking about it in November and the excitement just built until finally it was the big day. As I mentioned in my previous post, this 100 mile race inspired a great 10k race out of me in the morning. After the 10k, even though it was a typically busy saturday, I really paid attention to my recovery. Ultragen (check), Recovery Tights (check), good food for lunch (check), lots of water and electrolytes (check) and if I'd had my Recovery Pump at the time I would have put it to excellent use as well. I was checking my phone all day to get updates from Jason's crew chief Dani on how he was doing and when they would need me. The timing worked out perfectly, I got the family fed, and boys to bed, packed up everything I might possibly need and headed out into the dark night to the race site. The race was actually conveniently only about 1 hour from my house. It had been pouring down rain all day. At 9 o'clock at night, with the cloud cover, you really couldn't see more than a foot in front of you without a head lamp. As I pulled into the parking lot of the race site, I noticed it had turned into a small pond. 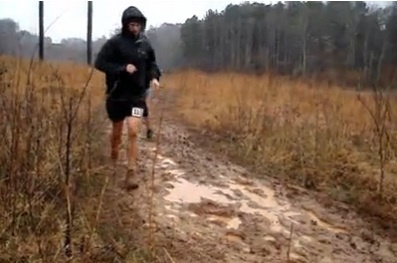 You couldn't walk without taking a step into a puddle, so you can imagine what it was like out there for the racers. 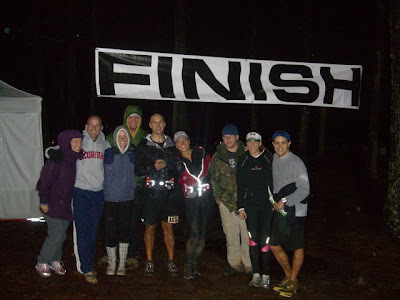 The race was the GUTS Reactor Run 100 and took place at Dawson Forest in Dawsonville, GA. The course was a 13 mile loop and 7 mile loop in a figure 8. I was on task for the 13 mile loop. 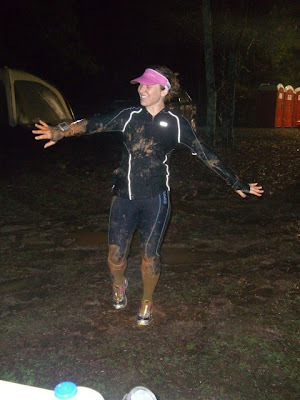 Race Volunteer: Is your runner still running? RV: but he's going to keep running? RV: how far do you think he'll go? Me: oh! he's going to finish! RV: (turns to another RV) hey! she's here to pace for someone, she says her runner is going to finish the 100! yeah, that's how bad the conditions were. It rained, all day, not just sprinkled, RAINED. The trails, which I'm told are mostly used for horse trail riding, are basically muddy rivers at this point. It's cold. It's dark. It's a little scary. and I couldn't have been more excited to be there!!! After my discussion with the race folks, I found the tent where our group was hanging out. I talked with some of the other pacers and the feeling amongst everyone was the same. Jason was doing great, he had a plan and he was sticking to it and everything was going well despite the weather. I got some tips from folks as to how he was approaching the run and what to do as his pacer. I got my gear together (because let's face it, 13 miles is 13 miles, I needed to be prepared to not NEED anything myself while I was out there). I laced up my brand new Avia Avi-Stolz trail running shoes and when Jason came in from his loop, I was ready to go! It was fun being there while people changed out his fuel belt bottles and got him what he needed. It made me feel great when he got a big smile on his face when he saw me there ready to go. 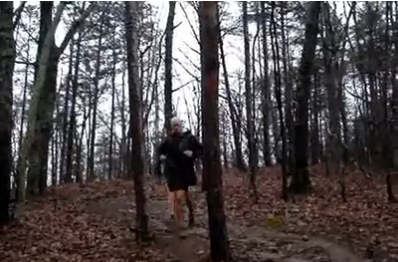 We headed out onto the muddy trail and it kind of felt like any other long run (to me). It was dark though and I was glad when our friend Yvonne (who was supposed to pace for someone who decided to stop at 50) came up behind to join us out there. Three lights way better than two. So what made the run so awesome? Well, first off all, it was the LAST TIME Jason would have to do this particular 13 mile loop. So everything became, that's the last time I have to go up that hill, cross this stream, slip down this hill, etc. 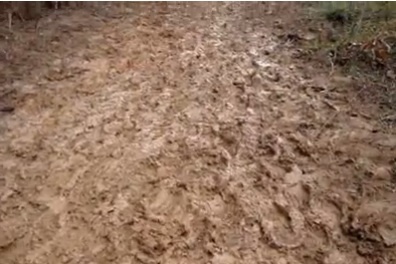 Secondly, it was like one big muddy slip and slide out there! Every step went SPLOSH and it just felt like I was 10 again (or maybe 5). I took a couple of spills because well let's face it, I'm clumsy as hell, and even the falls were fun! me covered in mud - of course!!! but most importantly, it was such an honor to be out there with my friend while he finished this accomplishment. I was there when he looked at his watch and said "90 miles, it's single digits now baby!" and I was there when to watch him struggle up a hill only to get to the top and start running, no hesitation, just getting the job done. It was this lack of hesitation that I found so inspiring. There would be no quitting on that day or any other. You could throw mud, rain, cold, darkness, rocks, water, and 100 miles and he would laugh and say "is that all you've got?!?" and just keep running. and so when it comes down to it, I witnessed something very special that day. Proof that when we approach something with the right attitude, the right mindset and the right plan, we can accomplish things we didn't dream possible. Everyone knew Jason would finish, if you know him, you knew he would finish. But he set a goal of under 24 hours. In those miserable conditions he finished that race, he finished in under 24 hours, in fact, he finished in 21 hours and 41 min. Almost 2.5 hours faster than plan. And he smiled almost the entire way! 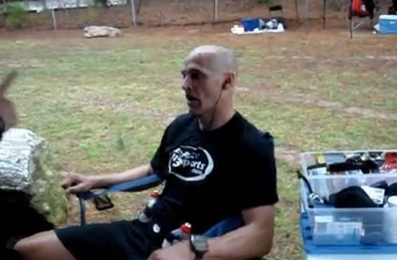 OB Finishes GUTS Reactor 100 mile race from tribirdie on Vimeo. "There is no quit in this body. There is no quit in this mind"
and you will achieve amazing things. To read Jason's race report on the day, check it out here on his blog! Jason with the world best support crew, his crew chief and girlfriend extraordinaire. Dani you were amazing out there!! OH MY GOSH!! What an honor!! To run with him and such an inspiration to watch him!!! Such a great blog post....cannot believe those conditions. I have a good friend who runs ultra's and I have to say your pictures are definitely the "hardest" looking...wow, good on you for running with him and what an amazing feat!! Your friend is such an inspiration. I love muddy runs where you reach a point where you just can't possibly get any dirtier, and it just doesn't matter anymore. Wow! What an amazing thing! "There is no quit in this body. There is no quit in this mind"- this is the psyche of a winner who endures. When someone with this mindset puts on a wetsuit, prepare yourself in seeing them take on the lead.